Ongoing field trials have validated the HBGV performance for several months. 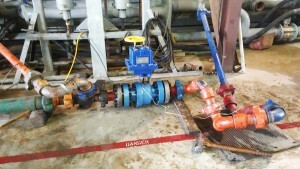 The newest installation in the test facility of a major pump manufacturer has been well-accepted as the HBGV outperforms the back pressure control valve it replaced. Daily use has subjected the valve to pressures up to 3600 psi. We have been stalking “bigger game”, and today we bagged it: 5000 psid and over 400 gpm. The HBGV was conceived to precisely control choked flow, and it did that. With the valve throttled below 10% open, SPL measured just above 80. So where do you find a 5000 psi flow test facility? You create one, with the help of a company in the business of servicing hydraulic fracturing skids. We adapted the 5000 RTJ flanges to 1502 hammer union fittings required in the 15ksi world. 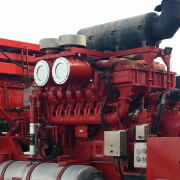 Next, the HBGV was connected to a manifold in front of the angle-pattern chokes in place for pump testing: The green intake pipe in the picture originated at the output of a piston pump driven by diesel motor supplying 1200 HP. Up to this time VSI has only offered field trial valves, and now we’re ready for a RFQ. Please contact us with your severe service control valve problem/application to find out why the HBGV would be a cost effective solution.